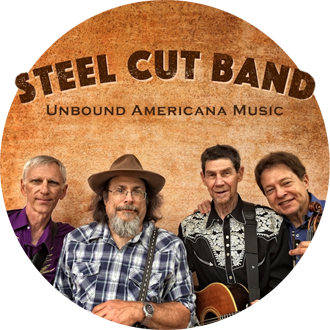 Steel Cut is a fun mix of Country, Bluegrass, Roots Americana, and good ol’ Rock ‘n’ Roll. Based in Ojai, California, these four veteran musicians blend vocal harmonies and lively instrumentals together for a unique sound that is always a crowd pleaser. Steel Cut has played the Ojai Lavender Festival, for the Santa Paula Agricultural Association, and various venues in and around Ojai. Guitars, fiddle, harmonica, and bass never sounded sweeter. Bob’s bio can be read on his Soloist profile here. A veteran of the California music scene, Lynn is a member of the famed Floyd County Boys. He has played the California State Fair, the Modoc County Fair, and Knott’s Berry Farm, among other popular venues. Lynn has opened for such stars as Jerry Wallace, Jerry Reid, Ray Price and notable others. After many years spent in the music business, Dave has yet to achieve overnight success. He is fond of clever band names, and has played in many groups including the Lowdown Payments, the Outrageous Odds, the Invisible Pants, Lost Weekend, and the Jitters. His goal is to be born wealthy in his next incarnation. Barney has performed at the California State Fair, Sonoma County Fair, various festivals, clubs, and weddings. Barney is a studio musician, having played on many albums of various artists.